Carlisle joint caretaker Tony Caig said their Johnstone's Paint Trophy win against Accrington was influenced by departed boss Graham Kavanagh. 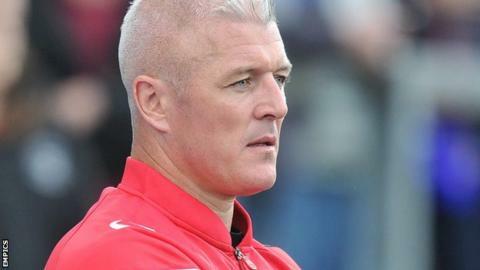 Kavanagh was sacked after Saturday's 5-0 defeat by Cambridge in League Two, ending a near 12-month stint in charge. Caig and Paul Thirlwell led the team for the trip to Accrington, as the team earned a first win of the season. "It was a culmination of all the work he put in the last few months," Caig told BBC Radio Cumbria. "We tried to put a squad we felt was capable and the structure that Kavanagh has had an influence on. It's quite sad he's not a part of it." Kavanagh's departure ended a six-year association with the Cumbrians that began when he joined on loan from Sunderland in October 2008. Thirlwell was a team-mate of the former Republic of Ireland international before his move to the coaching staff, while Caig has also been in the backroom team since his arrival at the club. "It's been quite emotional because I've worked with Graham on the coaching side for quite a few years now," Caig said. "We built up a strong relationship so it's always difficult when a friend of yours loses their job and it's been tough."